Transcript: Welcome to MyBinding.com. These are the Futura Black Letter Size Binding Covers from Fellowes. Welcome to MyBinding.com. 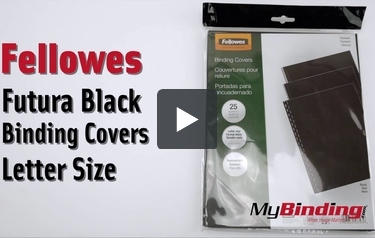 These are the Futura Black Letter Size Binding Covers from Fellowes. To show off your presentation with contemporary elegance, use Fellowes Futura binding covers. They have a smooth mild texture and a sleek attractive shimmer under the light. Made from heavy duty polypropylene materials, these covers are flexible, waterproof, tear proof and all around extremely durable. The don’t show age like lesser covers quickly do. These covers come in 8.5x11” with square corners, and 8.75x11.25” oversized with rounded corners. Purchase them unpunched, or prepunched to any standard binding specifications. Even add a window punch or business card slits.